A man who found his girlfriend was cheating on him had devised a rather comical way of welcoming the cheating girlfriend at the Airport. 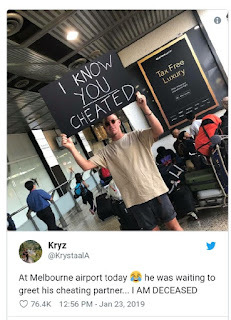 The photo of the man, standing in the airport in Melbourne, Australia with a huge sign saying “I KNOW YOU CHEATED” was posted on Twitter last Wednesday by twitter user Krystal. He was apparently waiting for the “cheater” to come through the airport.